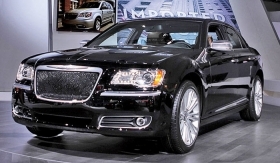 Chrysler has started production of the 300C Luxury Series. Sales begin in February. LOS ANGELES -- The Chrysler brand is moving its 300 flagship sedan upscale with the 300 Luxury Series. Production of the 300C Luxury Series has begun in Brampton, Ontario, and the cars will go on sale in February. The 300 Luxury Series essentially will be a Lancia Thema wearing a Chrysler badge. It will be positioned at the top of the 300 lineup. "It's a Lancia pitched as a Chrysler," said Saad Chehab, CEO of the Chrysler and Lancia brands. The Luxury Series will be sold with two powertrains: a V-8 Hemi teamed with a five-speed automatic transmission and a Pentastar V-6 engine teamed with Chrysler's new eight-speed automatic transmission. The Lancia Thema is the top-of-the-line Lancia sedan built on Chrysler's LX platform. It also is built in Brampton. The Luxury Series is Chrysler's latest effort at broadening the range of its flagship 300. Chrysler has also launched S-badged models aimed at younger consumers. The S cars come without the chrome and leather that have characterized the 300 and will come with the Pentastar V-8 and the new eight-speed automatic. Since Fiat assumed management control of Chrysler Group, the Chrysler and Lancia brands have been merging and sharing more models.